RUSI hosted a side event at the Munich Security Conference, exploring defence and security issues related to Brexit and the impact they may have on Europe, NATO and the transatlantic partnership. For the conference delegates, we released an advance version of a Briefing Paper by Deputy Director-General Malcolm Chalmers, which outlined five areas where Brexit will affect European security. The final version of this paper, revised to take into account Prime Minister Theresa May’s Munich speech, has been published on the RUSI website today. Malcolm also authored a report previewing the government’s Modernising Defence Programme, which is expected to cover the defence elements of the National Security and Capability Review. In the next few months, RUSI colleagues will be examining the Modernising Defence Programme in further detail in a series of commentaries, which began with John Louth, who proposed a ‘programmatic approach’ to the UK government’s exercise. Alongside these publications, in February we convened a series of events and conferences examining the challenges faced by the British armed forces. We had exceptional speaker panels at our conferences on Urban Warfare, Air Forces as Weapons Systems and Hybrid Warfare. We also presented our interim research findings on the Defence Industrial Strategy to an audience of senior defence policymakers, and that report is expected to be published next month. In March, we look forward to welcoming Stephen Lovegrove, who will reflect on his experiences managing the Ministry of Defence as its Permanent Secretary. I am also pleased to announce that the École de Guerre, France’s higher education institute for military education, has appointed some of my RUSI colleagues as visiting academic staff to their faculty. This month, Ambassador Mark Green, the Administrator of USAID, and the Rt Hon Penny Mordaunt, MP, Secretary of State for International Development, joined us to discuss the importance of security and development linkages in conflict zones. anti-money laundering framework to reflect today’s technological landscape. Regular updates on this new programme will be shared on the Centre’s website. We were delighted that the Centre's analysis was recently cited in the House of Commons second reading of the Sanctions and Anti-Money Laundering. Have you opted to stay in touch with RUSI? Due to changes to data protection regulations (GDPR), you need to confirm that you want to continue receiving these communications or we cannot send them to you after 25 May 2018. Please click the Opt-In button and follow the log-in instructions. Entitled ‘Brexit and European Security’, and written by RUSI Deputy Director-General Professor Malcolm Chalmers, the paper suggests that ‘achieving a strong post-Brexit security partnership will require difficult decisions on both sides’. Expert commentary in February examined a range of defence and security issues including Syria, nuclear policy, financial crime, UK Defence, Russia in the Middle East, the aftermath of the German elections and Middle Eastern investment in the Horn of Africa. For more RUSI Commentary, please click here. 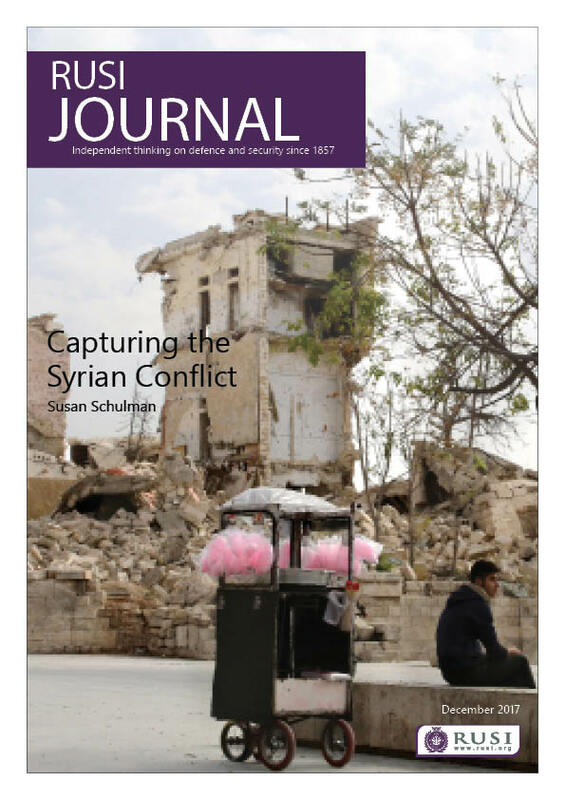 The latest issue of the RUSI Journal includes a photo essay by Susan Schulman on life in Homs, as the Syrian Civil War continues. Other articles cover North Korea's nuclear weapons programme, conscription in the Middle East, peacekeeping in the Central African Republic and the impact of conflict on the Ethiopian famine of 1984/5. SpaceX Falcon Heavy: That’s No Moon … It’s A Tesla! RUSI will be at the Security and Counter Terror Expo from 6–7 March. The expo is a world-class showcase of the capabilities, strategies and intelligence to keep nations, infrastructure, business and people safe. The event brings together 10,000+ senior professionals from Government, Private Sector, Critical National Infrastructure, Military, Law Enforcement, Transport Security, Border Security, Security Services, Major Events and Emergency Services. For more details, and to attend, please click here. RUSI is looking to recruit a Research Fellow to join the Military Sciences research group. The successful applicant will be leading and delivering research across the areas of interest. Specific interest and knowledge of one or more of the following areas is highly desirable: Naval warfare and maritime security, C4ISTAR, Space, and/or Ballistic Missile Defence/Integrated Air and Missile Defence. RUSI is seeking a highly motivated Research Analyst (Land Warfare) with excellent communication and time management skills to gain rare and valuable experience within an established research programme, with unparallelled access to military thinking as part of the Military Sciences group. We are looking for an individual with an interest in RUSI’s work in defence and security, particularly in organised crime. The intern will support RUSI with the Cocaine Route Monitoring and Support (CORMS) programme. This is an excellent opportunity for individuals wishing to gain experience at a leading think tank and embark on a career in these research areas. In February, RUSI experts spoke on a range of issues, including Syria, and Turkey's relationhip with Syria, Russian military technology, financial crime and UK-EU defence policy.